Basseterre, St. Kitts, April 15, 2019 (S.T.E.P.) — Persons employed on the Skills Training Empowerment Programme (STEP) as community enhancement workers are making a substantial contribution to the development of the country and no one should minimise the contribution they are making. Mr DeSuza, who has direct responsibility for the Skills Training Empowerment Programme, advised the community enhancement workers that the STEP had moved away from referring to them as clean-up groups and gangs, and is referring to them in an uplifting way as community enhancement teams. 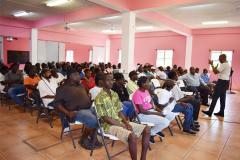 The next Soft Skills Training session organised for the STEP Community Enhancement Workers, which will be the last one in the series ‘Conflict Management’ on St. Kitts, will be held on Thursday April 18 at the St. Peter’s Community Centre for groups from the St. Peter’s, Stapleton and New Road areas.